"Jabba's put a price on your head so large, every bounty hunter in the galaxy will be looking for you. I'm lucky I found you first. " Slipping between the cracks of society, scoundrels and scum have a long legacy of profiting off the conflict of the Star Wars galaxy. The legacy of these scoundrels resides in their ability to survive, often times through less than savory means. 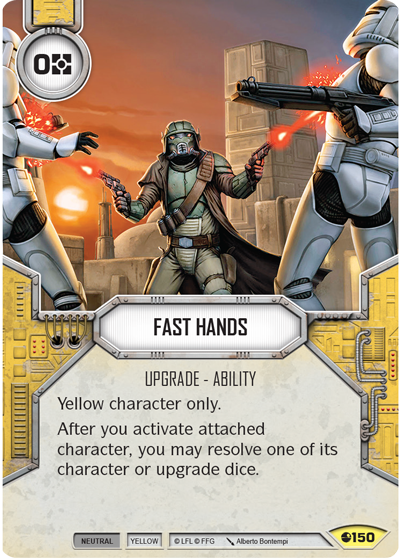 Today, we’re previewing the Yellow cards of Star Wars™: Destiny Legacies, currently available for pre-order at your local retailer or our website. Yellow characters continue to have one last trick up their sleeve, even when their back is against the wall. 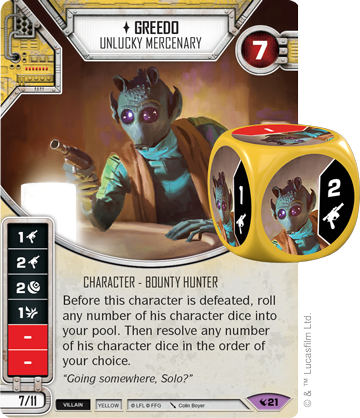 The legacy of Greedo (Legacies, 21) is an unlucky one. Caught in the unfortunate situation of cornering Han Solo in the Mos Eisley Cantina, Greedo nearly claimed the bounty on one of the most infamous smugglers in the galaxy before becoming just another mess. 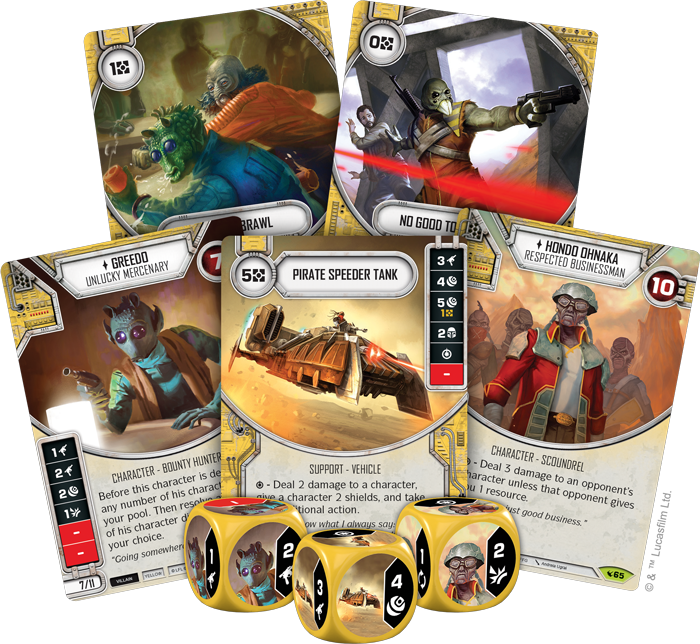 Now, Greedo brings his skills to Star Wars: Destiny. 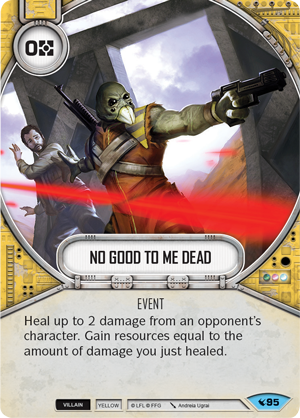 At only seven health, Greedo can’t take much damage, but he's always able to get one last shot off with his special ability. 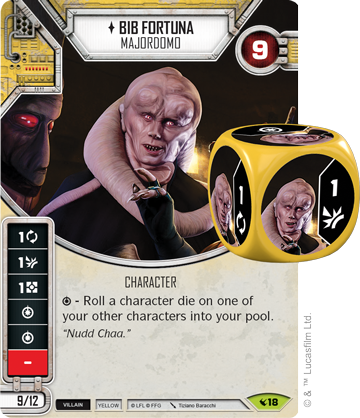 Greedo can roll any number of his character die into the pool and resolve them right before he is defeated, potentially giving you a final burst of damage. 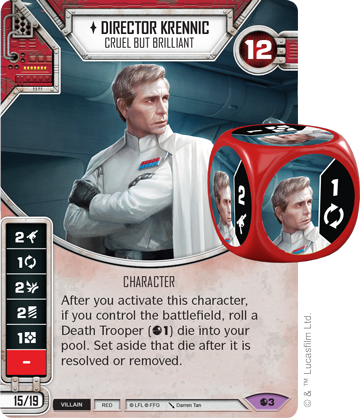 An elite Greedo can form a 30-point team with an elite Director Krennic (Spirit of Rebellion, 3), giving you five dice focusing on ranged damage while you control the battlefield. Not all Yellow characters are dangerous bounty hunters, however.The lair of a crime lord would not run smoothly without a proper caretaker, and few are as cunning as Bib Fortuna (Legacies, 18), majordomo to Jabba the Hutt. 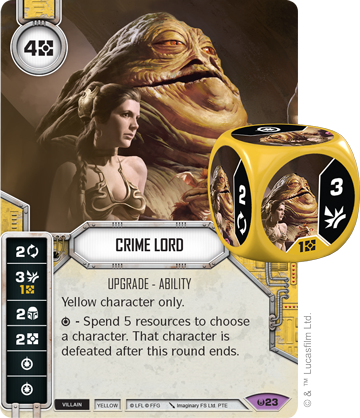 Bib is a master of coordinating Jabba's many criminal interests, and his die reflects that with its two special symbols. Rolling this symbol lets you roll a character die on one of your other characters into your pool. You may use this ability to roll out a character die and resolve it before that character activates, or to get extra mileage out of a die that's already been resolved. Bib Fortuna makes a fantastic servant and pairs well with characters with strong dice like Darth Vader, Sith Lord (Awakenings, 10). 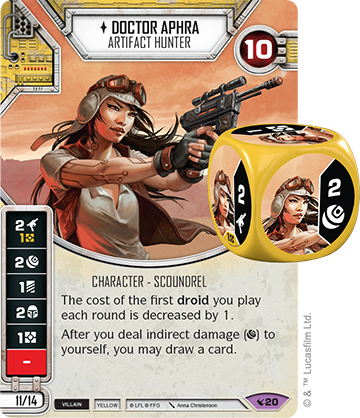 Previously announced Doctor Aphra (Legacies, 20) is one of the greatest artifact hunters in the galaxy, but can’t go far without her trusty ship, the Ark Angel (Legacies, 23). 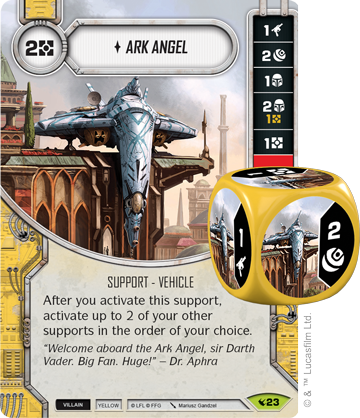 The Ark Angel is an incredibly efficient ship, and can quickly boost your action economy if you're relying on supports. After you activate the Ark Angel, you may activate up to two other supports in the order of your choice. 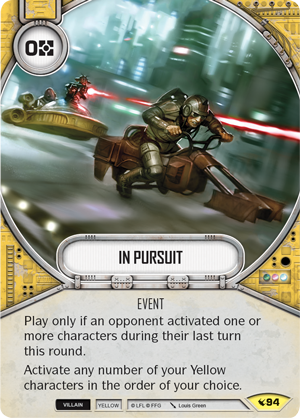 In a vehicle-heavy deck, this can activate a row of powerful ships very quickly and force your opponent to stare down a field full of strong dice. Supports aren’t the only type of cards that Yellow villains can mass-activate in a single turn. In Pursuit (Legacies, 94) invites you to activate all of your Yellow characters at once as they hone in on an opponent’s character. 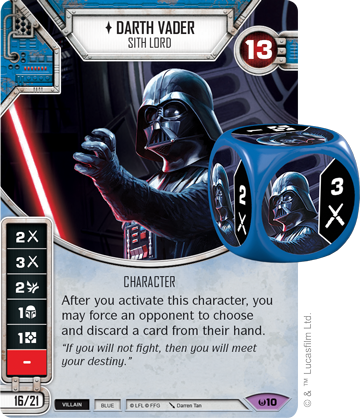 If these characters are equipped with upgrades like Fast Hands (Spirit of Rebellion, 150), some of their dice may even be resolved immediately, sending a barrage of damage straight at your opponent. 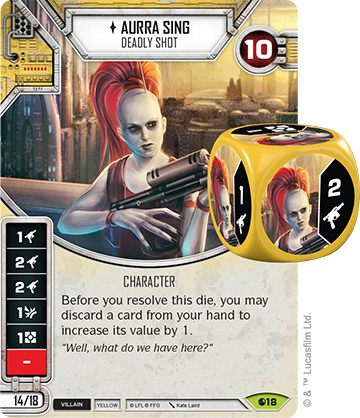 Yellow Villains will also have new ways to gain resources, including collecting on bounties with No Good to Me Dead (Legacies, 95). This event heals up to two damage from an opponent’s character in exchange for gaining resources. While healing your opponent’s characters may seem counter-productive, if the resources pay for something like Crime Lord (Awakenings, 23), the deal works out in your favor. Heroes come in many shapes and sizes, whether they are part of a rogue rebel cell or have been swept up in the galaxy-spanning saga, Yellow heroes have a legacy of courage and fearlessness when the time comes to act. 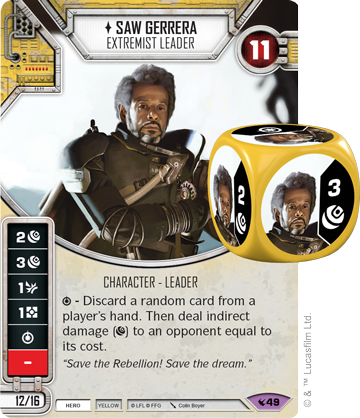 The rebel leader Saw Gererra (Legacies, 48) was considered an extremist to the Rebel Alliance, lashing out against the Empire in various ways. This modus operandi makes Saw Gerrera the perfect representation of indirect damage in Star Wars: Destiny, using the many tools at his disposal to defeat his foes both physically and mentally. Saw Gererra’s ability also hurts your opponent on multiple fronts—by both discarding a random card and dealing indirect damage equal to that card's cost. General, Senator, Friend, Jar Jar Binks' (Legacies, 47) legacy is many things. Though he was manipulated by Senator Palpatine into giving him additional power, Jar Jar has always meant well and is a true ally to the forces of freedom in the galaxy. Jar Jar Binks is one of the most unique characters in Star Wars: Destiny. For starters, any opponent may use an action to force you to activate Jar Jar. After he is activated, you and your opponent reroll all dice not showing the same symbol as one on Jar Jar's character dice. It's notable that Jar Jar’s die features no ranged or melee damage, guaranteeing dice showing those symbols will be immediately rerolled following his activation. 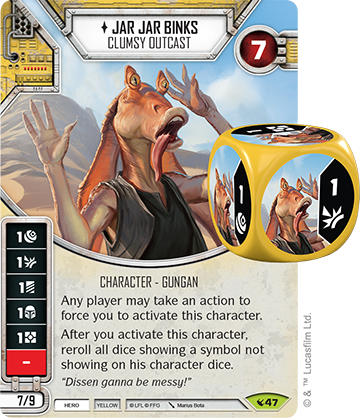 This can help you get out of some tight spots by rerolling your opponent’s dice—but Jar Jar’s clumsiness can get in your own way. If you're lining up the perfect move, your opponent may activate Jar Jar and force you to reroll dice already sitting on the perfect symbol. During the battle of Naboo, Jar Jar helped lead the Gungans to a triumphant victory over an army of battle droids. One of the most important weapons of the conflict was the barrage of Runaway Boomas (Legacies, 51) unleashed on the battlefield. These Boomas are imprecise, but can deal a ton of damage. 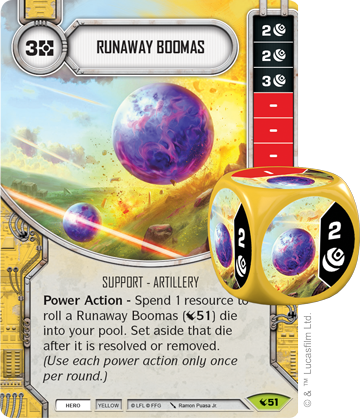 Furthermore, as a Power Action, they can cascade, allowing you to roll an additional Runaway Boomas die into the field. Runaway Boomas are just one of the ways Yellow heroes take advantage of indirect damage. 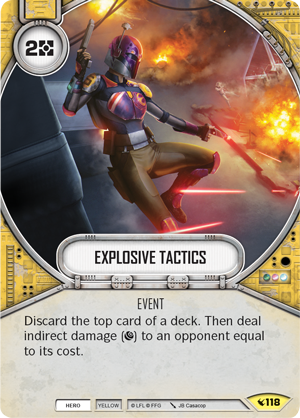 Explosive Tactics (Legacies, 118) allows you to discard the top card of a deck and deal indirect damage to an opponent equal to that card’s cost, whittling down your opponent’s deck while damaging their characters. The Star Wars galaxy is filled with heroes and villains in constant contact with one another. But maybe sometimes the distinction isn’t so easy. For some, good or evil does not matter, and profit takes precedence over moral obligation. This is something the respected businessman Hondo Ohnaka (Legacies, 65) knows well. During the Clone Wars and the early days of the Rebellion against the Empire, Ohnaka carved his own path through the galaxy, aligning with those who helped him most and making a profit along the way. Ohnaka is the only neutral character in Legacies, and that makes him extremely versatile. During deck building, Hondo may be paired on a team with other hero or villain characters, but not both in the same team. 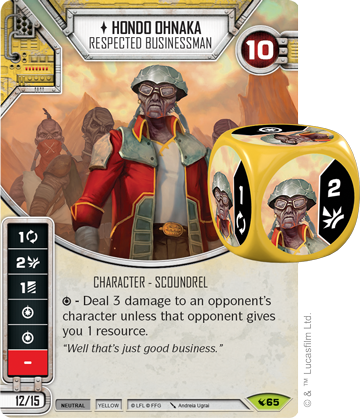 Hondo is not opposed to violence, but he would rather make a profit, as shown by his special ability that can deal three damage to any character… unless your opponent gives you a resource. As long as Hondo is making a profit, he is perfectly happy, whether he is assisting the Rebel Alliance by teaming up with Jyn Erso (Spirit of Rebellion, 44) or looking out for himself as he works with his old ally Aurra Sing (Spirit of Rebellion, 18). And whether they're heroes or villains, the scoundrels and rogues of the galaxy aren’t averse to getting their hands dirty. 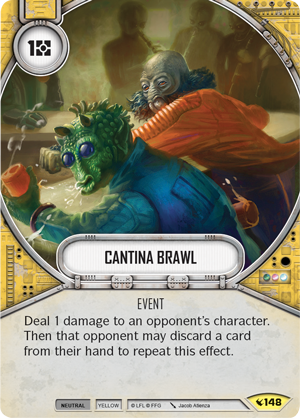 A good old-fashioned Cantina Brawl (Legacies, 148) can be slotted into any Yellow deck. The brawl lasts as long as both participants are willing, both having the option to discard cards to keep dealing damage to another character. If you are willing to sacrifice your hand of cards, you can ensure you will come out ahead in the brawl. 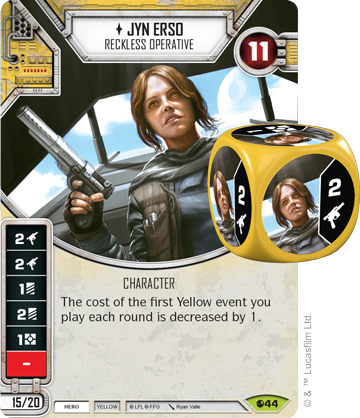 Warrior, extremist, pirate—the Yellow characters of Star Wars: Destiny have many legacies. What will yours be? 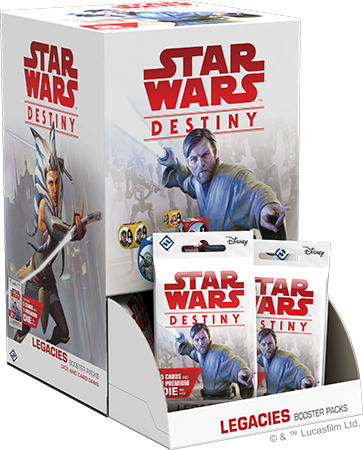 Build your legacy and pre-order Star Wars: Destiny Legacies (SWD11) from your local retailer or from our website here! Look for Legacies Booster Packs at your local retailer early in the first quarter of 2018.